Being the guardian of a Great Pyrenees Mountain Dog as a pet is an amazing and rewarding experience. A tremendous amount of patient, gentle, firm, persistent, positive-reinforcement training is required to raise a dog that has social skills and confidence and displays the accepted Great Pyrenees temperament. 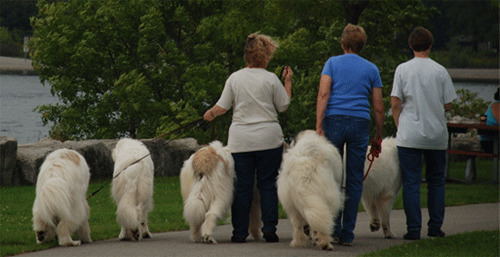 Wherever you go with a Great Pyr, people will stop, look and engage you in conversation about your dog. That is where all of your hard work pays off as the dog is neither aggressive nor timid and is quite tolerant of the affection of strangers. Do you know the top 12 questions asked about a Great Pyr? Behind the scenes you have prepared your Pyr well. As a result of your gentle and consistent training, your dog knows is a faithful companion. And to keep those good looks, grooming a Great Pyrenees requires brushing once or twice a week as required, especially when blowing coat in the spring and fall. It is important to prevent the undercoat from matting by removing lose hair during this time. Nails and dewclaws should be trimmed regularly. Also, as for all dogs with folded ears, regular examination and cleaning of the ears is required. Do you own a Great Pyr? You can share your story with us here. There are other realities. You will be reminded constantly that these dogs like to bark. It’s their job. And yes they shed… twice a year and most months in between. And sometimes they drool… especially when a favourite treat or any food is presented. Hey… let’s face it… every treat is a favourite treat to a Pyr! Oh, and don’t forget, they are big and take up a bit of space. They particularly like to lie across any doorway or entrance. Must be that guarding instinct at work. Want to see Great Pyr Stories from visitors to our site? 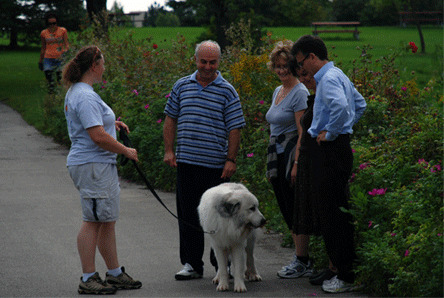 A regular daily walk is important in establishing and maintaining a healthy bond with your Great Pyr. It is also great exercise for both of your. Let's face it… fish like to swim, birds like to fly and dogs like to walk. Pyrs generally like a set routine, even though they are up to spur of the moment events. If you establish a routine of walking your dog at 6:00 a.m. before you go to work, be ready and willing to take your Pyr for a walk at 6:00 a.m. on Saturday and Sunday, even though you would rather sleep in a little. It is so important to them that they will get you up! Honest! Often they decide what their routine will be. By this we mean they will be Okay with things in general, but want it a certain way. One of our club members reports: "I walk Wizard every morning and evening before dinner. But Wizard wants a walk with "Dad" after dinner. It is like this is his special time with Dad. He will go with me if I insist but he goes to Dad every night for this walk. He established this… not us. Either of us was prepared to take him initially, but this is what he prefers." Pyrs like to explore a lot of territory and are very apt to roam if they get loose, so a pen (at least 5ft by 10ft) and/or securely fenced yard is a must for times when you leave your Pyr outside. And those fences for the yard and the pen need to be at least 6 feet tall and should be constructed so your Pyr cannot dig its way out. Yes… they like to dig and those big paws mean business. Yes, a Great Pyrenees Mountain Dog is a big commitment so be prepared. If you want a dog to tie on a rope, the Great Pyrenees is definitely NOT for you. Most important, Pyrs love to be with their people but they also love to hang outside. At home you will enjoy this gentle giant. They are the companions and protectors of their family and are very protective of the home and those that live in it. You will marvel at a Great Pyr's instinct and ability to evaluate threats and sense danger. A great Pyr is an amazing companion that will love you and protect you even at the cost of its own life. Read this amazing true story. What is it like to have a Great Pyrenees Mountain Dog? It is like nothing you have ever experienced. Once you have one, no other dog will do. Is a Great Pyrenees for you? Here is the ultimate test!